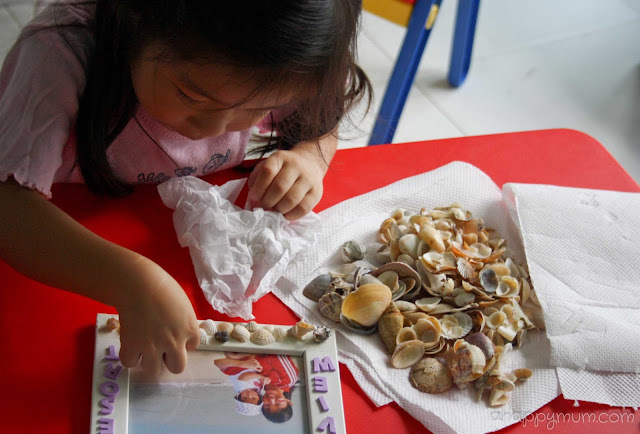 My girl fell in love with picking up seashells when we were at our seaview resort getaway. 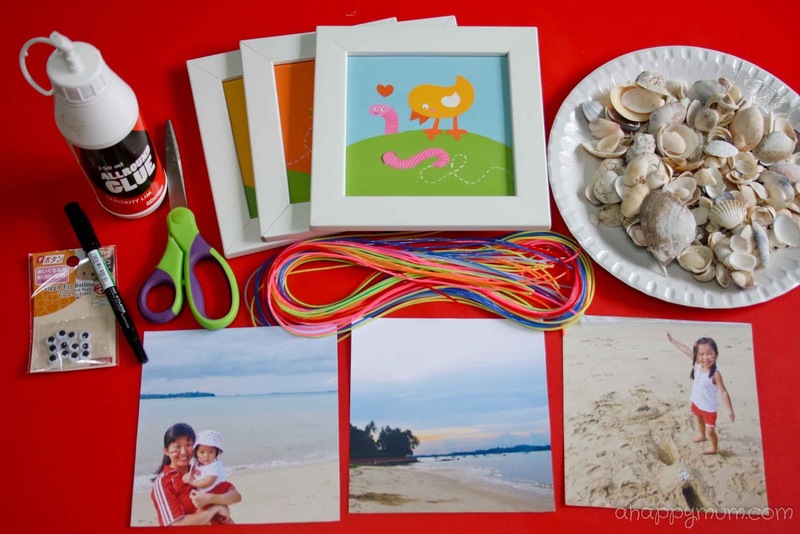 I can vividly remember how I loved it as a kid and the joy that came with finding that special, one-of-a-kind seashell which you refused to go home without. Well, in three days, Angel and I found hundreds of those. She said each of them was unique and while I told her to search for big, unbroken seashells, I realised she was more keen on the small ones simply because they reminded her of herself and her baby sister. 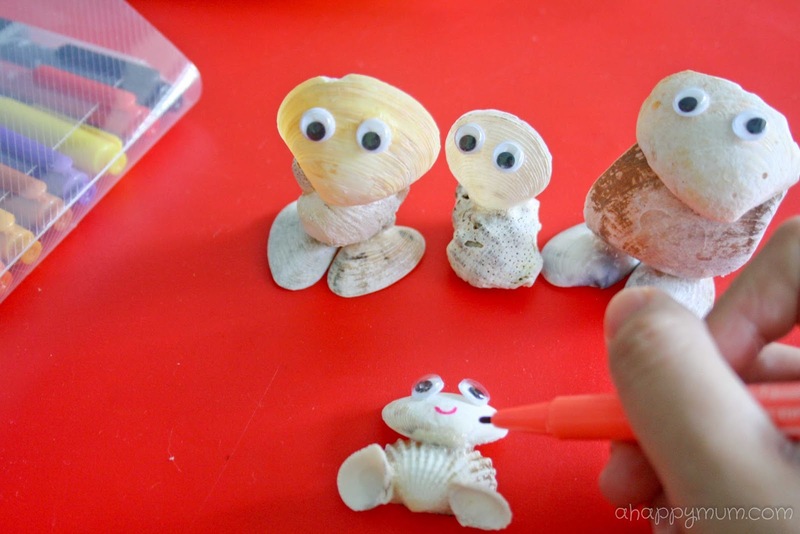 Thus, when we got home, we decided to do a simple seashell craft activity. Firstly, that helped us to use up some of the seashells. By some, I mean not even a quarter. Secondly, it was a good way for us to remember that beautiful stretch of beach. 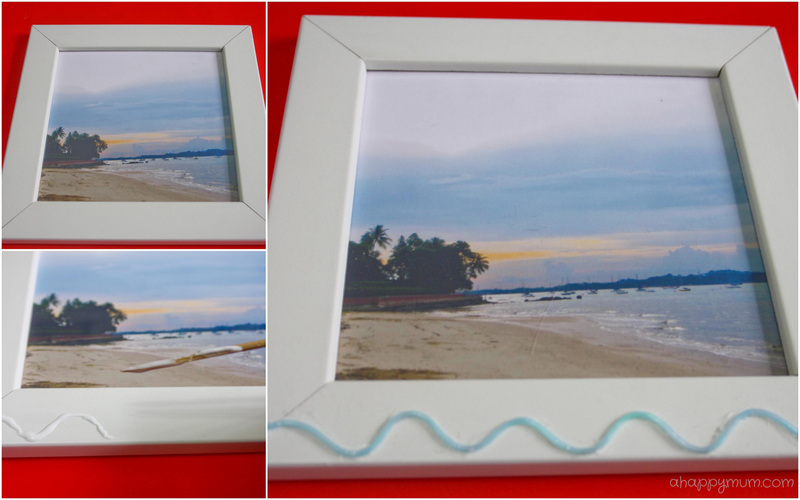 Firstly, we inserted the pictures into these photo frames bought at IKEA previously and started to decorate the border. Since it was associated with beaches, we decided to use blue strings to create waves. This got a little tricky and we had to use a satay stick to apply the glue and double sided tape to secure it. Hot glue would probably have been a better option but my 4-year-old would be unable to handle that at this stage. Next, it was time to practise her alphabets! 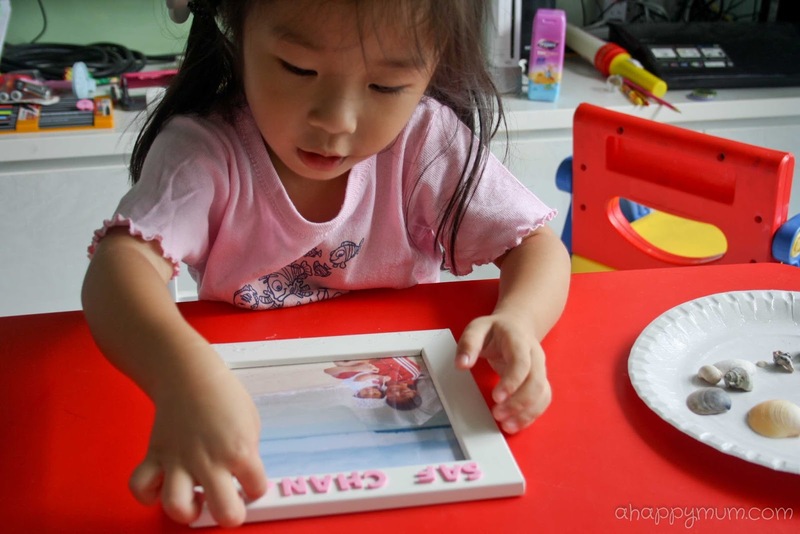 We spelt out the name of the place we visited and she took charge of sticking the alphabet foam stickers onto the frames. After that, it was time to play with seashells! All I did was to stick on a piece of double sided tape along the frame and asked her to be creative in arranging the seashells to fill up the space. She was really enthusiastic about it and even made sure she dried every seashell before sticking so that they would not fall off. Just to add some sparkle, we also applied some glitter glue onto the frames. 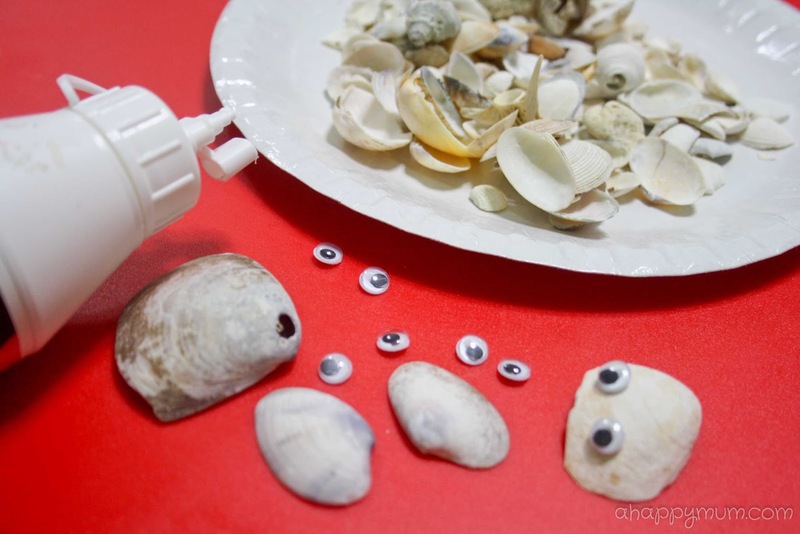 Lastly, it was my turn to have some seashell fun! 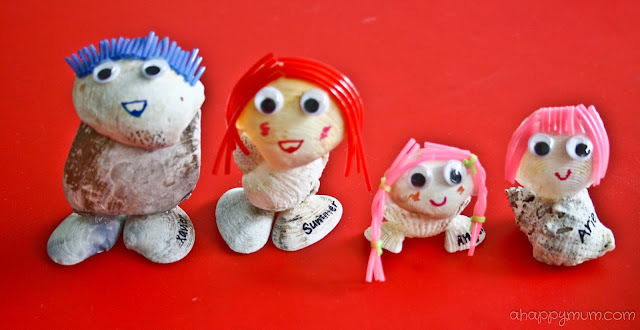 Together with Angel, we picked out seashells to form figurines and created our 'family' using just seashells, glue, googly eyes, markers and strings. She always says we need to add a smiley for everything we draw. So I made sure we did not miss that out. Ta-dah! Presenting our happy seashell family of four, complete with flamboyant hair and personalised names. Angel was thrilled that she had plaits! In case you are wondering why Ariel seems to look taller than the big sister, well, if you look closely, she has no legs since she cannot walk yet and thus she is sitting in her pram. Imagine, ok? Now, we are all done and this really brightens up our living room! Well, the only problem is we just need to find more space to display these if we are going to make one for every beach we visit! Plus I need to get a storage box for those seashells! Just for fun! Read this! The seashell figurines are so cute! Keke I think so too! And best of all easy to make! Lol. =) Thanks for dropping by! I love your seashell family! Wow it seems you managed to collect alot of shells! I have never been to changi beach, usually east coast or Sentosa. Not many shells! And nice ones? Even fewer! Keke I look good in red hair? Or Sammi Cheng again? Lol. =p Oh yeah, ECP is disappointing when it comes to seashells. I was pleasantly surprised to find so many big and small, most importantly intact, seashells here in Changi! It was a delight just to stroll at the beach and hunt for them every day! I love this issue of craft!! It's so beautiful! reminds me of the stack of little tortoise that used to be very popular! If you get what I mean.. hahaha..
Haha thanks Jade!! I think I do, although we a bit different era, muahahaha! 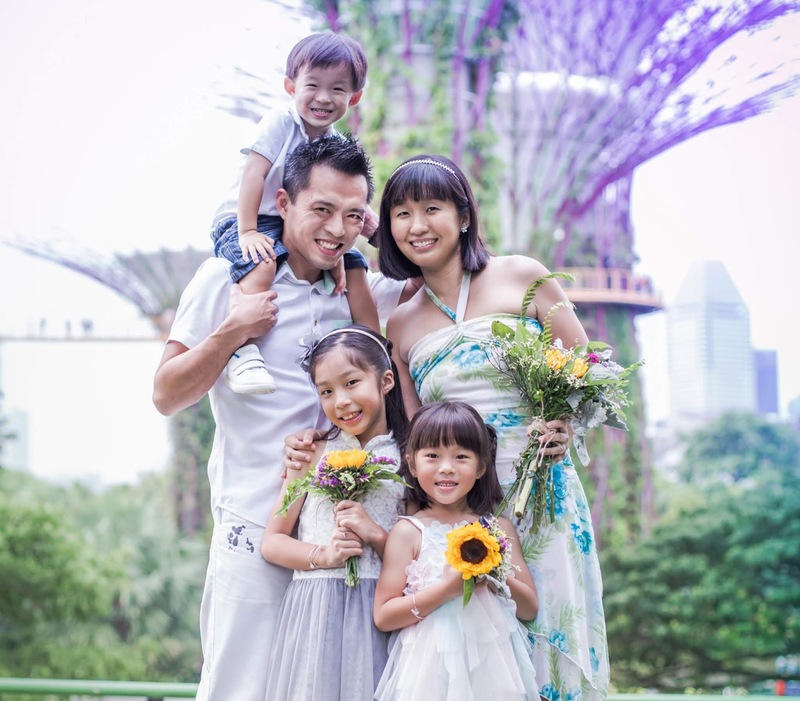 u too young liao! 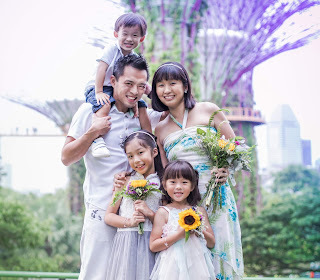 The seashell family is so adorable! Hehe you think so? Thankew thankew! wow! 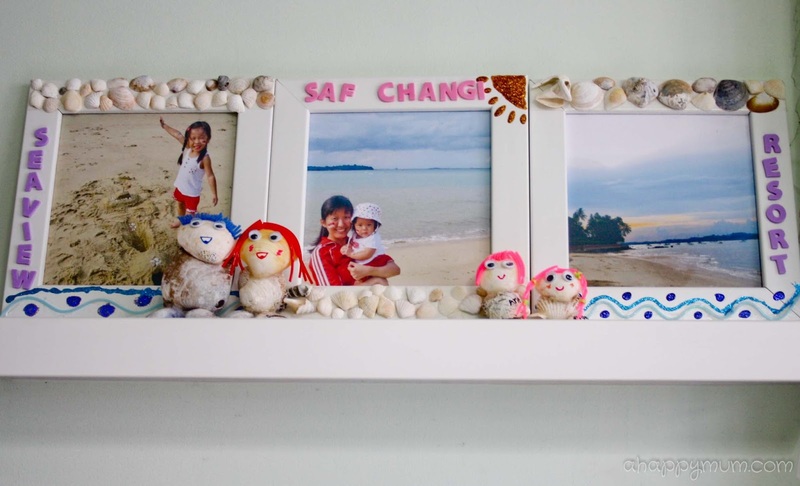 I love those seashell photo frames and figurines!! So creative!! Great idea! And I love your seashell family!! Thanks much, glad you like it! I LOVE Sea Shells and this is a very creative project and your little girl did a great job too! By the way, what do you mean by she likes her pleats? You meant plaits as in hair plaits? Haha yes Georgia, plait, pleat, I always confuse them! Thanks for correcting me! !